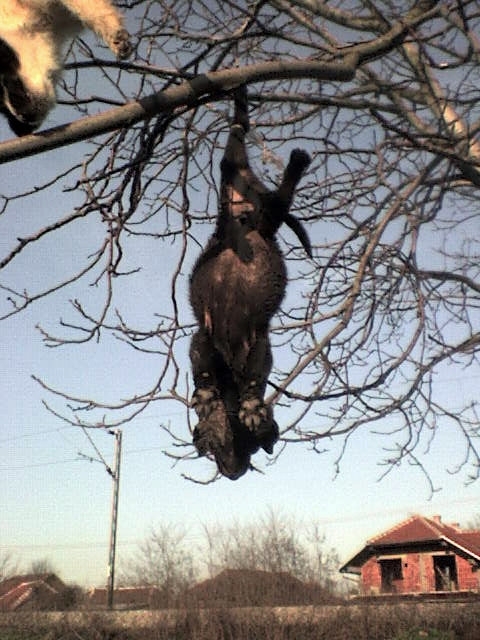 Niš – A group of children in the village of Donje Međurovo near Niš found by the tree at the end of football field six corpses of dogs. Dogs over the age of five months were killed and then hanged by legs on tree branches, but identity of person responsible for brutal massacre of animals is still unknown. Dušan Stojanović, President of the Association for the Protection, Care and studying the animals “Zoo planet” from Niš, said that the police filed criminal charges against unknown perpetrator. “According to the initial information we have obtained, the crime took place on March 8 or 9. Dogs were first drowned, and then hanged by legs upon the tree. What happened here is a real disaster, so brutal crime against animals is not recorded in the Niš area yet. Therefore, we will file criminal charge to the police. According to the new law of animal welfare, one year imprisonment sentence or a fine of 30,000 to 300,000 dinars can be enforced to the one who committed this crime – says Stojanović. This horror movie scene was recorded with mobile phone by a girl who went that morning the nearby playground; photographs have been later submitted to the “Zoo Planet” association, with a request to discover the perpetrator of the massacre. “There is an very delicate link between violence against animals and violence against people, because one who can make injuries or kill an animal today, can do the very same thing to a human tomorrow. “Having in consideration the brutality of the crime and that the sight the children who were passing by the crime scene that day saw, we expect successful discovery and strictest punishment against the perpetrators”, added Stojanović. The Police stated that said that they received notification, went out to the crime scene and started looking for the perpetrators. I am gravely disturbed to learn of the deliberate torture of dogs in Nis, as perpetrated in the presence of children. These dogs were deliberately hung on tree branches and killed in a blatantly cruel manner. This is not an isolated incidence and factually represents an indefensible, ongoing campaign conducted by communities to address the growing population of homeless animals. Indeed, given the transparent nature of these killings and the seeming lack of official intervention and termination, it is alleged that municipal approval has been extended to sanction this. As such, I am demanding immediate intervention to protect these animals and criminalize the people responsible for such cruelty. Allow me this moment to elaborate. Animals are sentient creatures who, as humans, experience joy, loneliness, fear, and pain. As humans, we unethically elevate ourselves to a status of superiority over all other beings, thereby rationalizing the brutality to which we subject them. We embrace this position as an elite class of six billion individuals, adopting euphemistic descriptions and apathetic banalities to justify this inequity. Speciesism, the discrimination of other beings, is a dangerous precept on which to stand, as immoral as sexism and racism; when human animals allow the exploitation and killing of 60 billion non-human animals globally and annually, we have become a group willingly complicit in such brutality, apathetic and selfish, disguising such maliciousness as excusable necessity, which is not only grossly unjust and immoral, but it is also exceedingly wrong. Ours is not a challenge to be regarded as humans against humans but rather as a welcomed obligation, indeed privilege, to maintain an international attitude of compassion and justice to our non-human animal friends. We do not gain power or control by degrading animals but rather we desensitize ourselves to all cruelty and victims become mere numbers, statistics, or unethical financial means. Objectifying animals by condoning their abusers’ violent acts or rejecting animals as undeserving of empathy and respect only erodes our capacity for humaneness towards all living creatures. It is impossible to contemplate supporting any country, via tourism or commerce, that excuses such blatant animal cruelty; as a direct consequence, the global community, refusing to defend this maliciousness, will condemn any further exploitation through personal boycotts. Ours is not an ambiguous request; you should understand that further killing will prove not only socially unacceptable but also financially irresponsible. As such, please provide immediate relief for these innocent animals and instead be a representation of animal compassion and strive to foster an ideal whereby animals are respected and empathized by your citizens. Allocate resources to construct shelters; implement sterilization and vaccination programs to prevent homeless populations and colony disease outbreaks; accept local and international advice and assistance; implement laws addressing current legal vulnerabilities; and enforce existing laws establishing animal cruelty as criminal. I hope this letter finds you willing to scrutinize both your own involvement in the intentional exploitation of animals and your desire to therefore protect, rather than harm, them. Thank you for your attention to this urgent issue.